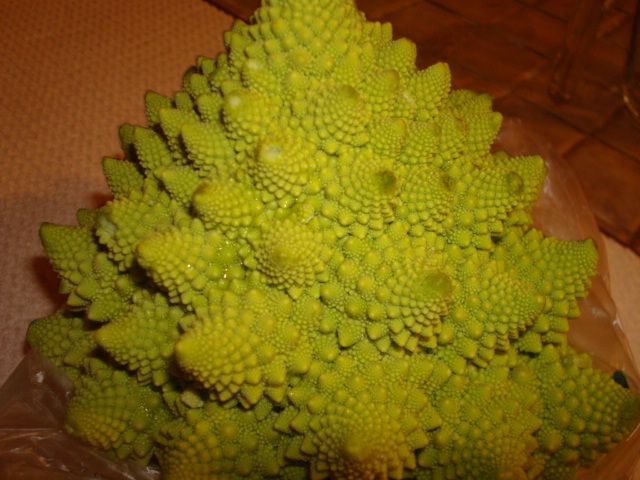 Romanesco: Fibonacci goodness for your tum-tum! This edition of my wellness blog will be about food. I happened upon this odd fractal-ish looking cruciferous veggie at a Wegmans. I’ve never seen it anywhere else. Apparently it is related to broccoli and cauliflower and boasts the following nutritional benefits: 1 cup raw yeilds 25 calories per serving, 10% of your daily potassium, 10% of your daily fiber and 2 grams (4%) of your daily protein. Also slightly more vitamin A and C than white cauliflower. I sauteed it with garlic, balsamic vinegar and olive oil, and sprinkled parmesan cheese on it. It was yummy, but I found part of the joy of this weird veggie is the fun texture, which softens with cooking, so you could break off the florets and top a salad with them.